Buzz Aldrin Gears up For "Dancing"
We know Apollo 11 astronaut Buzz Aldrin can walk on the moon, but can he do the tango? Buzz Aldrin, 80-year-old veteran of the first moon landing by Apollo 11, is facing a much more down-to-Earth challenge as a contestant on the new season of TV's "Dancing With the Stars." Aldrin — the second man to step foot on the moon — will be one of 11 contestants who pair up with professional dancers to compete in the series' weekly dance-offs. The former astronaut says he was never a big dancer, so has a lot of catching up to do. "I'm not known for that agility," Aldrin told SPACE.com. "I'm one of those people who need continued exposure. Whether it's flying a spacecraft or trying something out on the dance floor, it takes a while to really get comfortable with it." Aldrin has already started learning his dance for the premiere episode to air March 22 — the cha-cha. And he is working on the next week's dance, the foxtrot, with his dance partner Ashly DelGrosso-Costa. "She's a dream," he said. Costa is even planning to accompany Aldrin on a trip to New Zealand this week for a space conference, so the two can fit in some dance practice on the road. Though he'll be up against some stiff competition, including U.S. Olympic figure skating gold medalist Evan Lysacek, Aldrin says he plans to play hard. "I wouldn't have gotten into the space program if I wasn't competitive," he said. But the space pioneer's primary motivation for joining the show is to help bring NASA and the U.S. human spaceflight program to the front of popular consciousness. "Until there's a spectacular success or failure, the space program is not on everyone's lips," Aldrin said. "Dancing with the Stars" has "a very large audience of millions of followers and I felt that it would really be nice if the space program had that large an audience." He said popularizing space is important for inspiring young people to pursue science, technology and math. 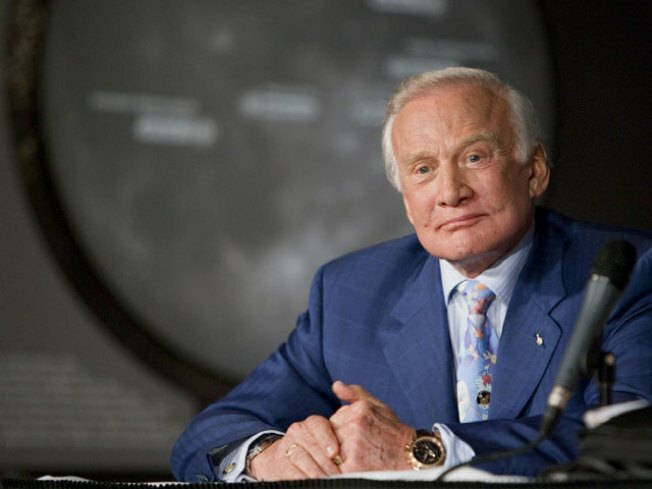 In keeping with this goal, Aldrin also recently taped a guest-star appearance on an episode of the sitcom "30 Rock." "That was very enjoyable with Tina Fey and Alec Baldwin," he said. Aldrin hopes to tailor his "Dancing With the Stars" experience to reflect his background — perhaps by dancing to a moon-themed song at some point. And there should be secondary benefits from the experience. "I'm anticipating a renewed smaller belt size shortly," he said.